We drove into a hidden gate on a late rainy afternoon. There was a guard with a golf cart waiting to take us down a long driveway buried deep into the woods, where we went into a gallery space with large painting and watched a short introduction to the couple and house. Then we proceeded to the house where we put on booties to protect the floor AND entered my parent’s house – or at least that was my first impression. Large open living spaces downstairs with a spectacular winding staircase to the upstairs which had a narrow hallway opening into compact bedrooms, bath rooms and office spaces. The epitome of what we called a modern house, now 50 years later called mid-century contemporary, very Frank Lloyd Wright. Very clean simple lines, glass block walls, which my Dad being an airplane designer, used in designing the house I grew up in and cost under $2,000 to build, here you will see rendered in a much more expansive form. George L. K. Morris and Suzy Frelinghuysen, prolific abstract artists since the late 1930s, were a remarkable couple at the leading edge of the national and international art scene. Collectors and intellectuals, they created a Berkshire home that reflected their aesthetic worlds. Frelinghuysen and Morris are today being widely rediscovered and evaluated as significant figures in the history of American art. Now you can tour their world, preserved just as it was when they created it. In 1929, George L.K. 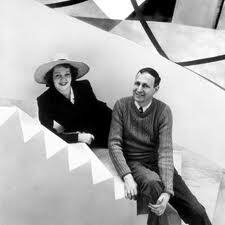 Morris traveled to Paris and studied with Fernand Leger and Amedee Ozenfant in Ozenfants’s Le Corbusier designed studio. On his return to America, Morris wanted to duplicate the white-stucco walled, notched roof, open-spaced studio. In 1930, with the help of Boston architect and Yale classmate George Sanderson, he designed and built his studio on a portion of his parents’ Lenox, Massachusetts estate, “Brookhurst.” It was the first Modern structure to be built in New England. The Wadsworth Athenaeum’s Avery Memorial Building and the Gropius House in Lexington, Massachusetts were built several years later. In 1941, now married to artist and singer Suzy Frelinghuysen, Morris chose a local architect, John Butler Swann to design a house which would be integrated into the existing studio. Swann admired Modernism and had spent time in the indigenous buildings of Arizona and New Mexico. A two story stucco and glass block house with a colorful mural by Morris connecting the house and garage was built. Cost overruns forced Morris to consign a Picasso, “The Poet”, for sale. 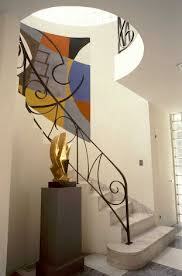 Peggy Guggenheim bought it for $4,500 and jump-started her museum in Venice. Local Lee marble was used in the foyer; an Argentinean leather floor was placed in the living room. Frelinghuysen and Morris enrolled in the Art Students League in New York City to learn the ancient art of fresco. Morris executed the frescoes in the living room; Frelinghuysen created her designs in the dining room. Frelinghuysen and Morris chose furniture by Modern masters Frankl, Deskey, and Aalto to complete the harmony of art, architecture and design. Upon her death in 1988, Suzy Frelinghuysen left instructions that the House & Studio and art collection be used for an educational purpose and the co-trustees, nephew T. Kinney Frelinghuysen and Christine Beshar, established a 501C3 charitable foundation. After receiving approval from the two towns of Stockbridge and Lenox, on which the 46 acre estate lies, the House & Studio opened for visitation in 1998.